My interactions with Millie were always very important and scientifically intense, but they were almost all in the same setting — namely, at conferences. When I picture Millie, I always picture her at conferences. She was like the eager student, trying to learn new things. She went to every talk — no breaks! 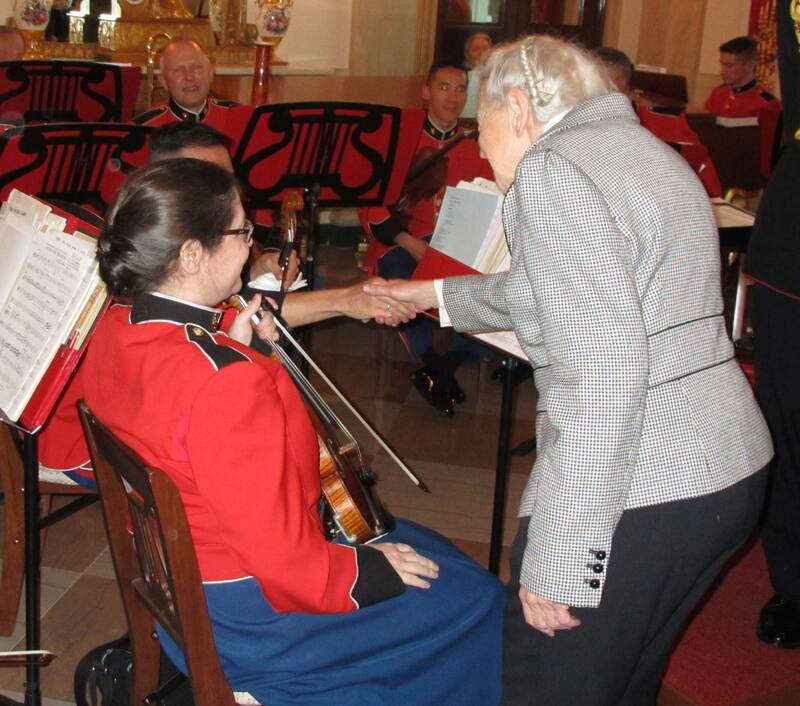 And, of course, she would always sit in the front row — not using her laptop or checking her emails on her phone. No! She sat in the front row with a piece of paper and a pen, and she took notes on every single talk. 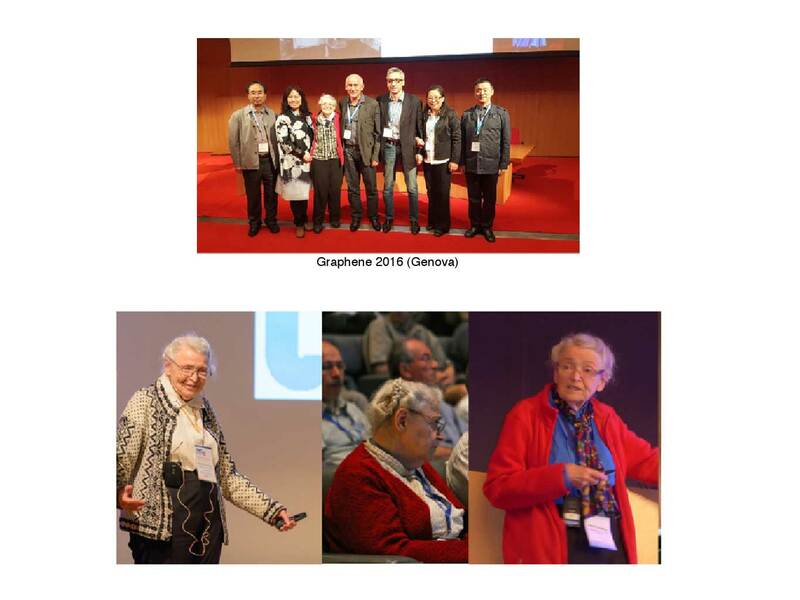 And, many times (including in the Graphene conferences of 2016 and 2014), at the end of the conference, Millie would stand up and give the conference summary. Basically, this is an overview of all the talks that were given at the conference and what we learned from the conference as a whole. This is incredibly difficult to do — as any who’ve tried it will know — because you have to know and understand the content of all the talks, regardless of the subject matter. Millie, of course, always gave fantastic conference summary talks — and that's really amazing. In fact, I find Millie’s entire decorum at conferences is so inspiring to me. It makes me feel embarrassed that I'm sometimes checking my emails at talks. The next time I do this, perhaps I’ll think of Millie and put my phone away. Millie was supposed to come to the 2017 Graphene conference in Barcelona, as Pablo has already said. We invited her to give a talk — and Pablo, as well — and we thought they could travel together. Above, you can see the abstract she submitted for her talk. It starts with, "Graphene goes back a long way, to 1947 or maybe earlier." I have to admit — I didn’t really know that, and I find it extremely interesting. I think a lot of people probably don’t know that. Can you believe this? Millie was planning, even at her age, to start thinking about a completely new field and to begin to make important contributions to it. That really is inspirational. It really is incredible. 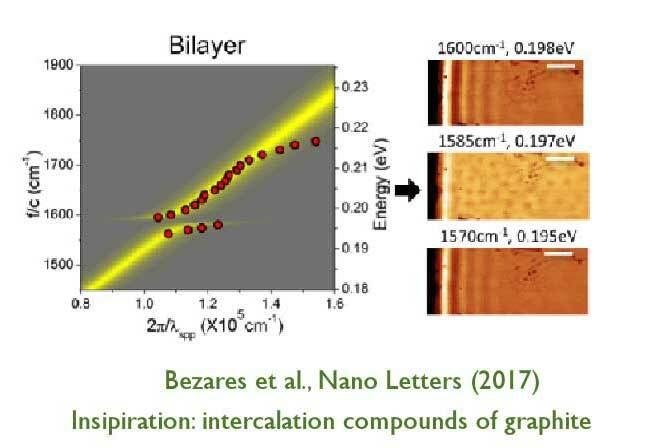 Unfortunately, she didn't make it to Barcelona to present the talk described in this abstract, but we will remember her for all the talks she made in the past, and we will look forward to the future of layered nanostructures, inspired by her words. Thermoelectric effects were also close to Millie’s heart — as well as graphene. 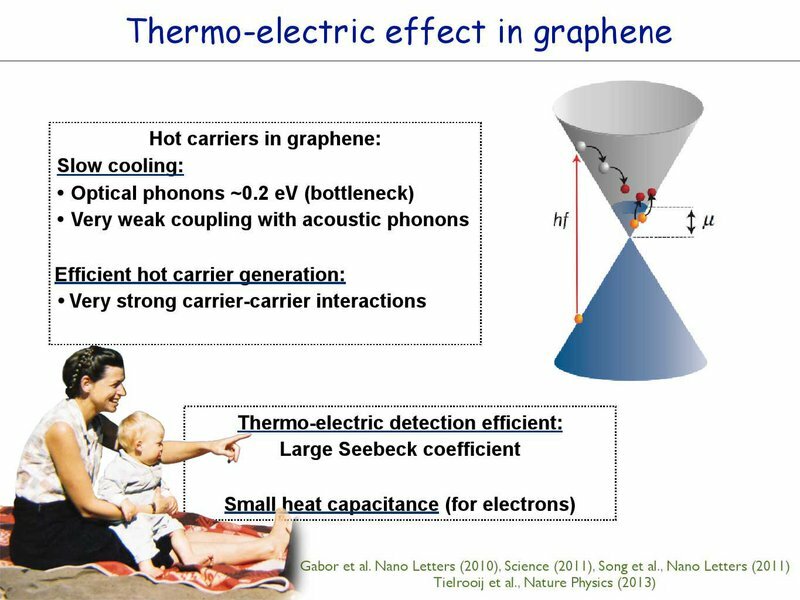 And in graphene, there's a lot of interesting physics related to thermoelectric effects, like electron-electron interactions, electron-phonon interactions, and non-local effects (as I will show you). 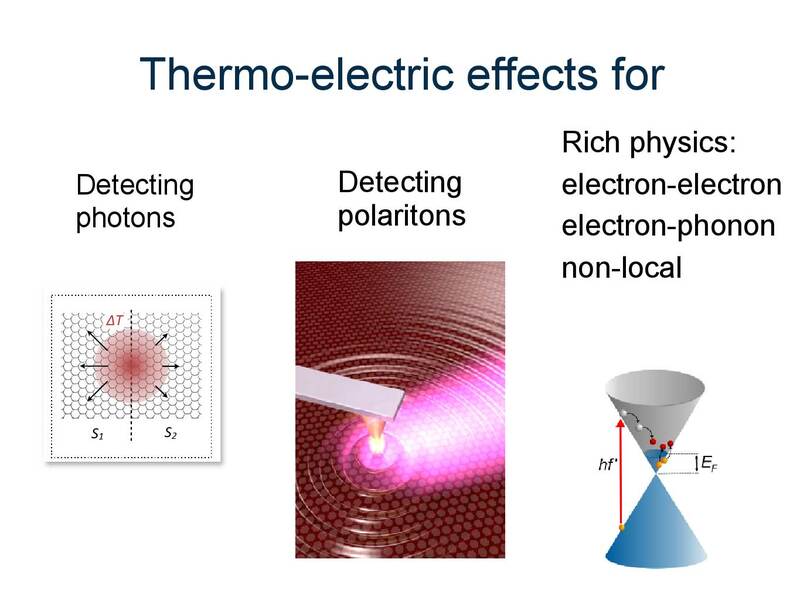 We can also use these effects to detect photons — convert photons to heat and then to photovoltages — which is interesting in and of itself. 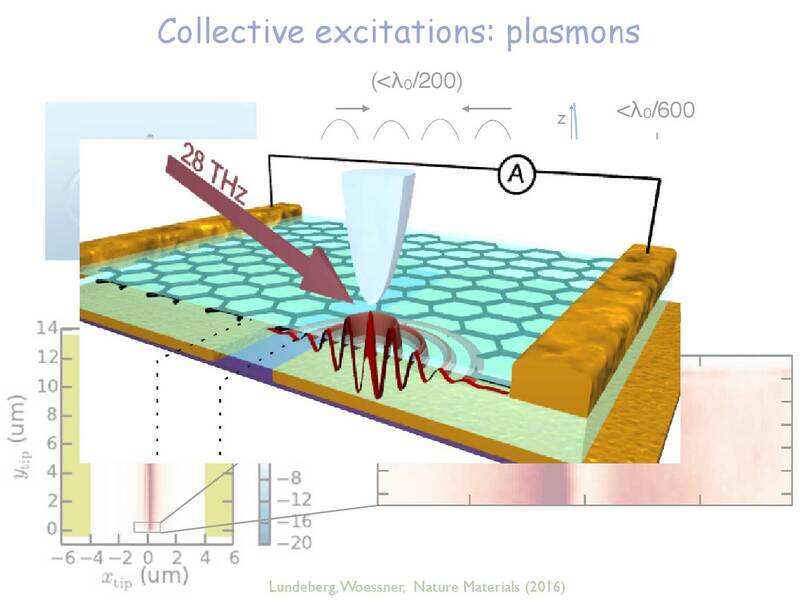 But, actually, it’s even more interesting than you imagine, because you can also use these effects to detect plasmons — collect excitations — and learn something about collective excitations in graphene. What is unique about thermoelectric effects in graphene is that the coupling between electrons and phonons is weak, first of all. 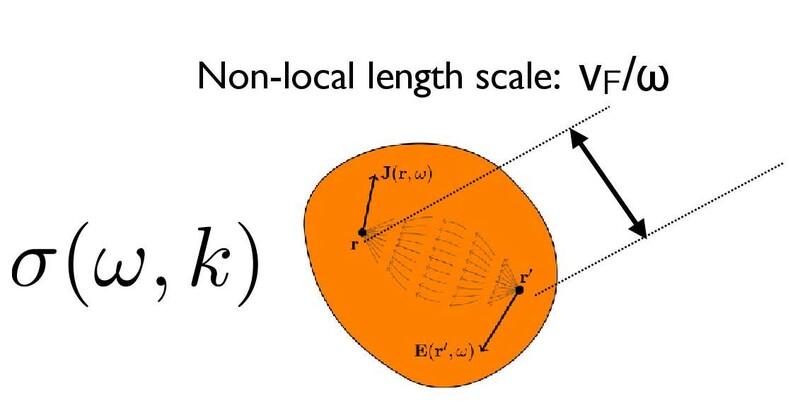 Acoustic phonons have a weak coupling and, for optical phonons, the energy is very large, so there's a phonon bottleneck. 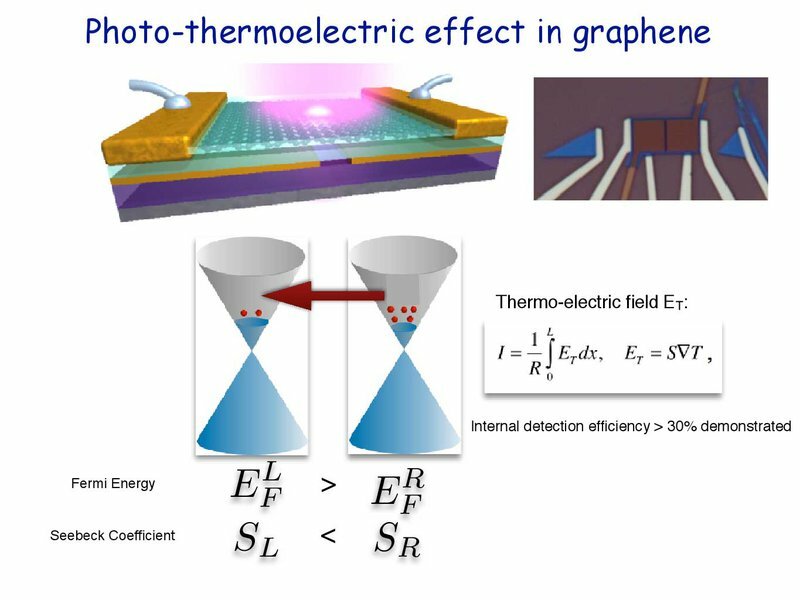 It has strong carrier-carrier interactions, which means that a photon absorbed into graphene is quickly converted to hot electron excitations. And, at the same time, graphene has a large Seebeck Effect. So all these things, combined, makes graphene a very strong and very interesting material to use for thermoelectric conversion of light into voltage. There's a lot of interesting physics, here, in terms of this cascade process, or what happens after you excite an electron and it decays into multiple electronic excitations. To measure this, you can use simple device geometry. 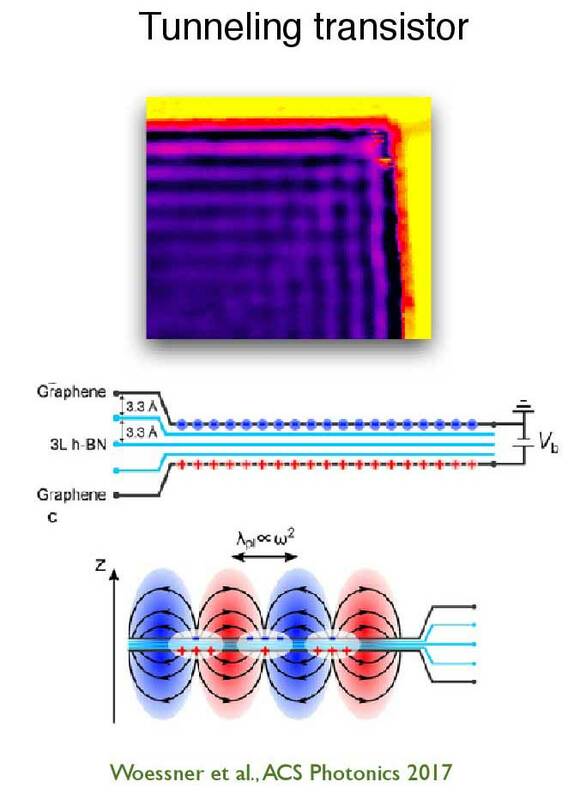 You can create a device that consists of graphene with a PN junction, in which two gates can tune carrier density in two sides of the graphene — and this generates a difference in the Seebeck coefficient. And when you illuminate this junction with light, then this difference in Seebeck coefficient drives a thermoelectric effect, which is governed by the equation on the right of the slide above. This was already measured, early on, in devices with gates. This was actually done by Harvard, MIT, and McEuen groups. The key signature, here, is that electrons flow in the opposite direction than you would expect from the photovoltaic effect. That means if you apply an electric field while photovoltaic current flows in one direction, then the thermoelectric current will flow in the other direction. You can also do this time resolved. 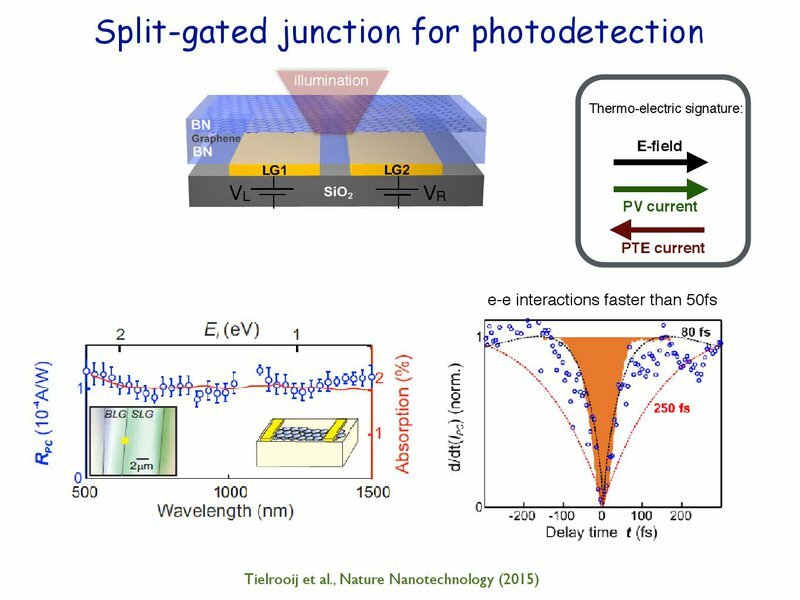 It was shown that electron-electron interactions happened faster than 50 femtoseconds, because the thermoelectric voltage was generated so fast. Now, that’s not new. But what is new is something we recently worked on — something that was quite striking! This began as just an ad hoc experiment. But we asked: what happens if I redo the previous experiment, but make the laser spot 10 times smaller? Or even 100 times smaller? Answering this question turns out to be very interesting. It turns out, you cannot do this effectively by just shining a laser. What you can do, however, is shine a laser on a metallized AFM tip. This tip has a curvature of about 20 nanometers. As you create a local hotspot, the light is concentrated in just a 10 nm radius. If you then scan this tip (which, basically, means you scan the laser spot), you see, also, here, it's a PN junction — a strong conversion between light and electrical signals. As expected. And, here, you can see the gate dependence, which also shows thermoelectric. However, now, if you look close to the edge, you can see these oscillations, here. I don't have time to go into details, but, quite quickly, it was clear that these are collective excitations. 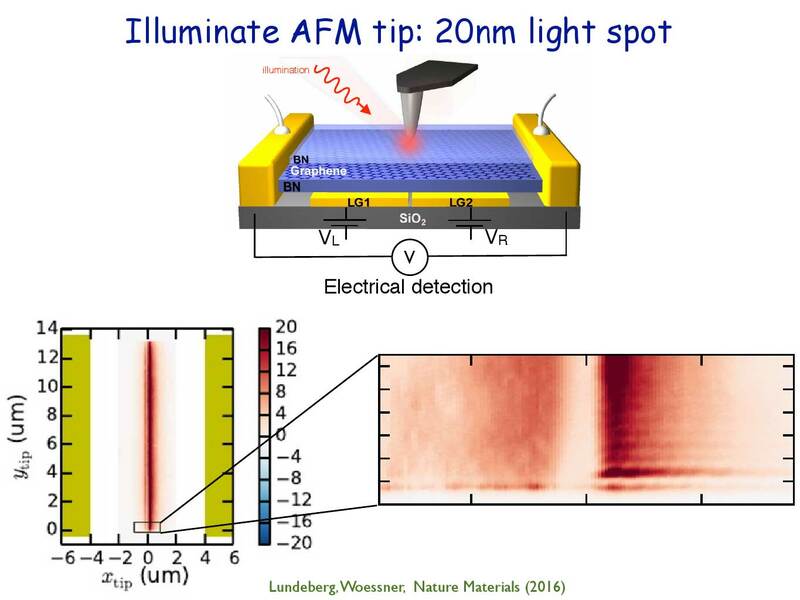 So, basically, now, the tip is providing the momentum to create excitations like plasmonic excitations. And those are electronic oscillations. What does that mean? It means the electrons are basically shaking inside the graphene, and they are coupled to the light. And remember, those excitations have wavelengths that are about 100, 200, or even 300 times smaller than the light. 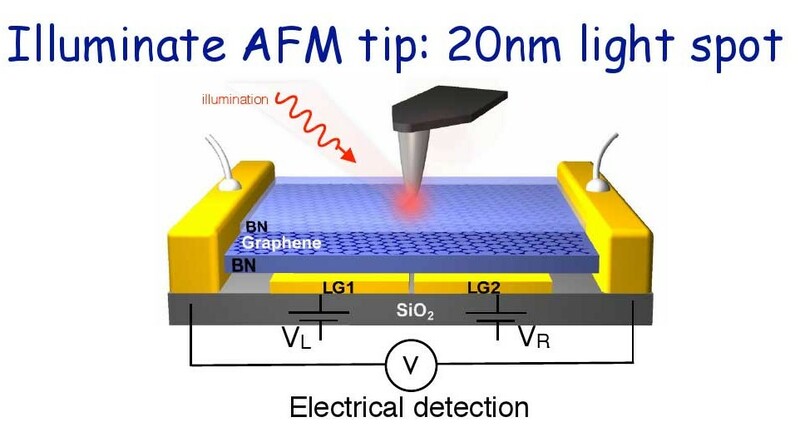 That's actually one reason why we can’t just shine a laser at the graphene — we need to use the AFM metallized tip. We’re basically doing the equivalent of throwing a stone into the water and watching it create ripples on the surface of the water. 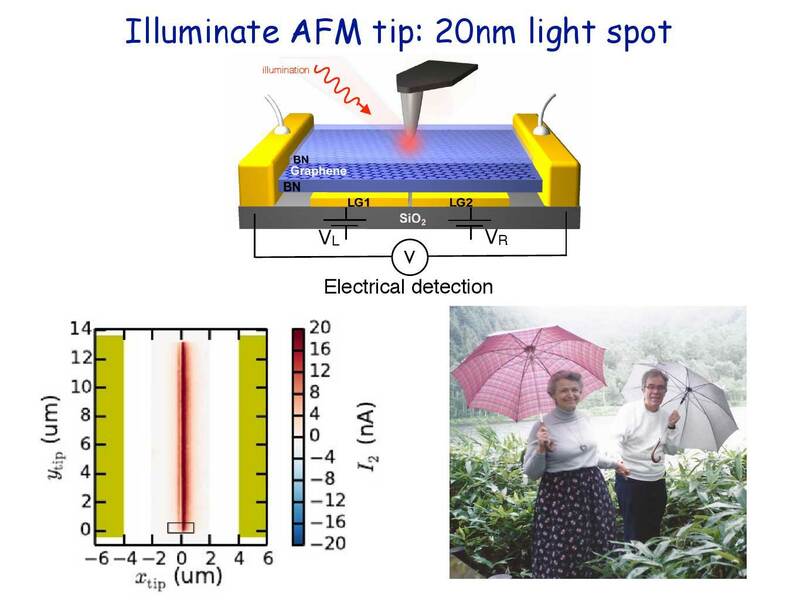 In a similar way, our AFM tip acts like a stone, and when we shine light at the graphene (throw the “rock” into the “water”), then these ripples are the plasmonic excitations. 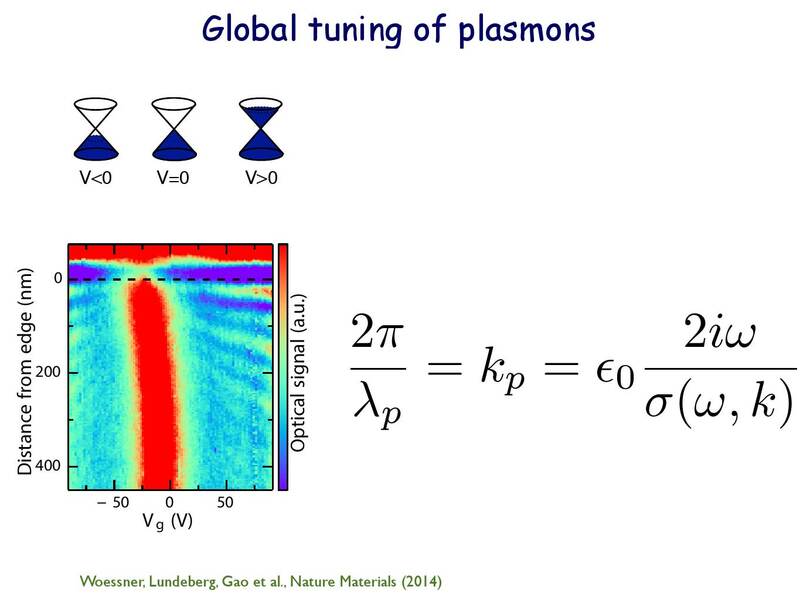 What deeper analysis has shown is that these plasmons, now, decay into heat and produce these voltages. And the interference pattern shown on the slide above is, therefore, a result of plasmons that are interfering close to the edge. From this, we can learn a lot more about the physics of the system — just by realizing that the plasma wavelengths/momentum scales with the conductivity of the material (in this case, graphene) and, usually, the conductivity is either static or depends on frequency. 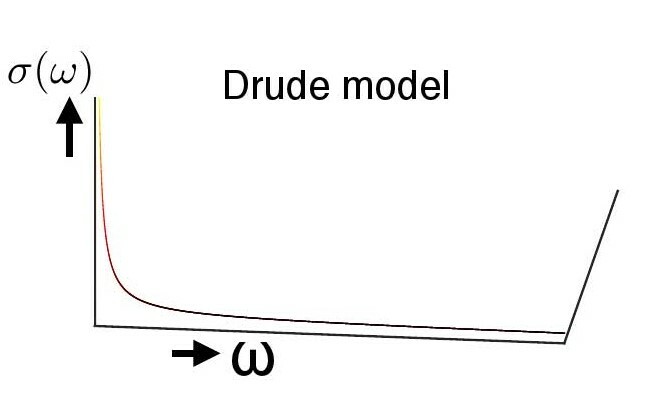 Then, we have something what we call a simple Drude Model. What is interesting about this, now, is that there's momentum dependence! There is an additional term in the conductivity — a momentum-dependent term. And you can see this as a sign of non-local conductivity — that means an electric field can drive currents at a different location than where the electric field is created. 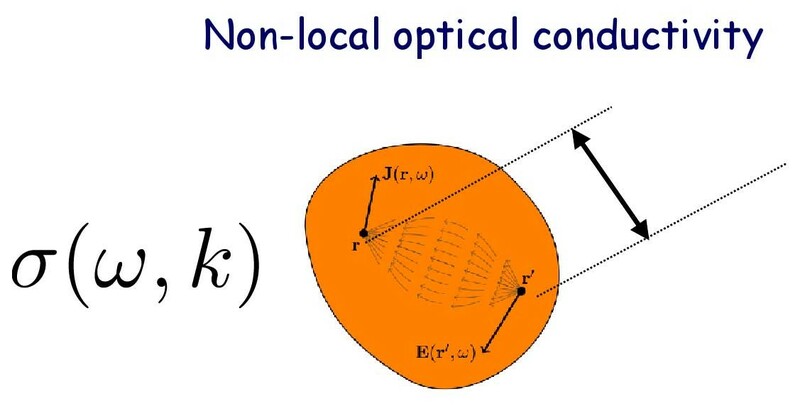 Non-local effects in space convert, in Fourier space, to non-local effects in momentum space. I’ll give you a simple picture that’ll help you understand this. 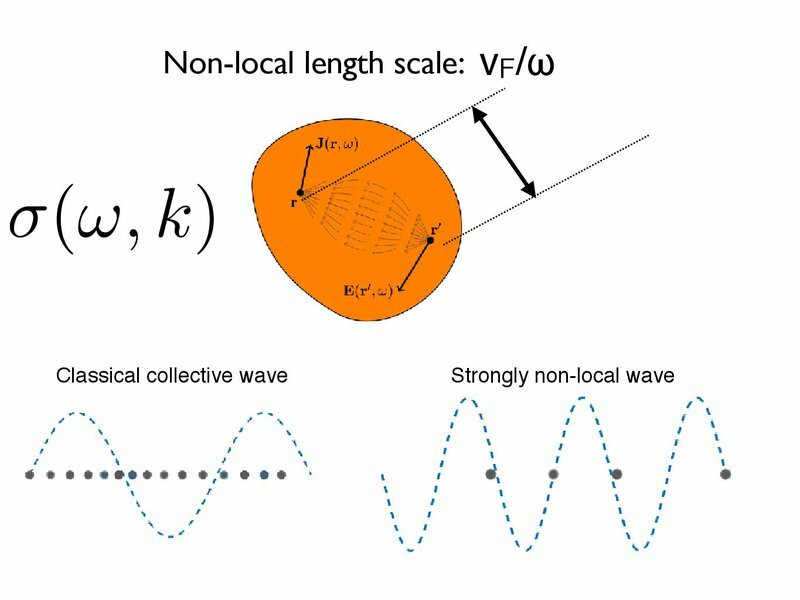 Here, you can see that, if you just have a classical collective wave, electrons move over a very short distance, and the wave moves very fast. But if I have a wave that moves very slowly, then the wavelength of this wave is similar, in scale, to the motion of the electrons. And that’s when the non-local effects kick in. You can also see that by looking at the Drude model in momentum and energy space. So, in energy space, there's a resonance — basically, zero frequency — but in momentum space, there is also a resonance. And this is the resonance we want to probe, now, using optics. 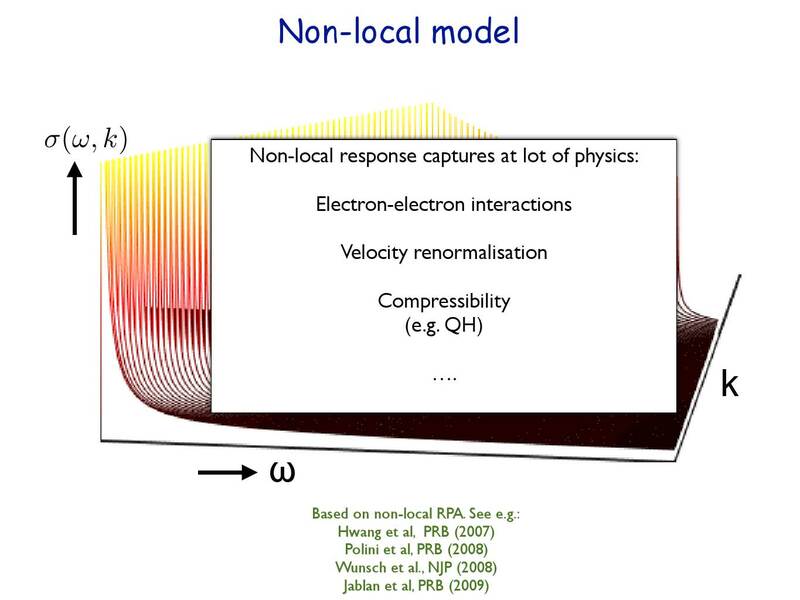 I would also like to note (as an aside) that this type of non-local optical conductivity captures a lot of interesting physics — such as velocity renormalization, electron interactions, many body effects, etc. So, how large is the effect? Actually, the typical length scale associated with this effect tends to scale with the Fermi velocity divided by the frequency. Okay? So, for visible light — if you do optics with only visible light — these effects would be tiny (below 1 nm). But if you do this with terahertz frequencies, this effect can be very large (about 50 nm). And, at the same time, the plasmons that we study have a length scale that are similar to 50 nm. You can also convert this to velocities. 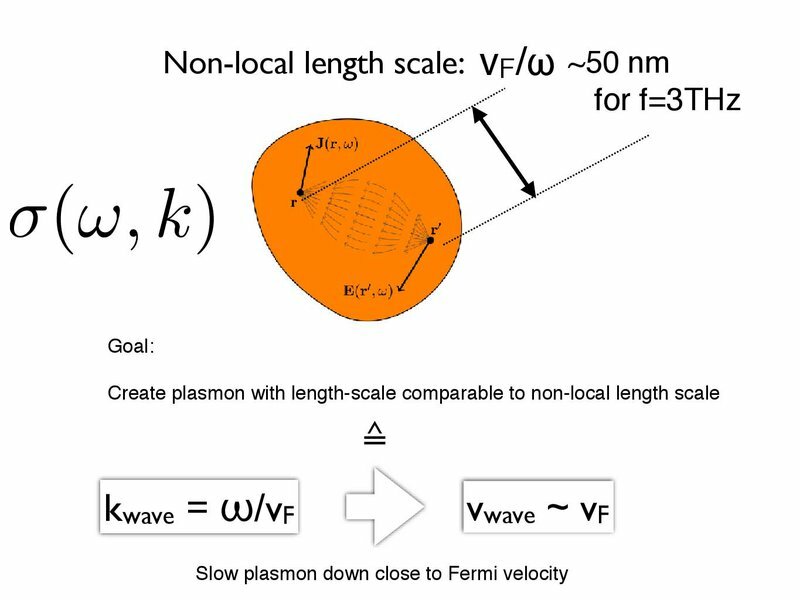 Basically, if the velocity of the plasmon approaches the Fermi velocity of the electrons, then these non-local effects become very strong. 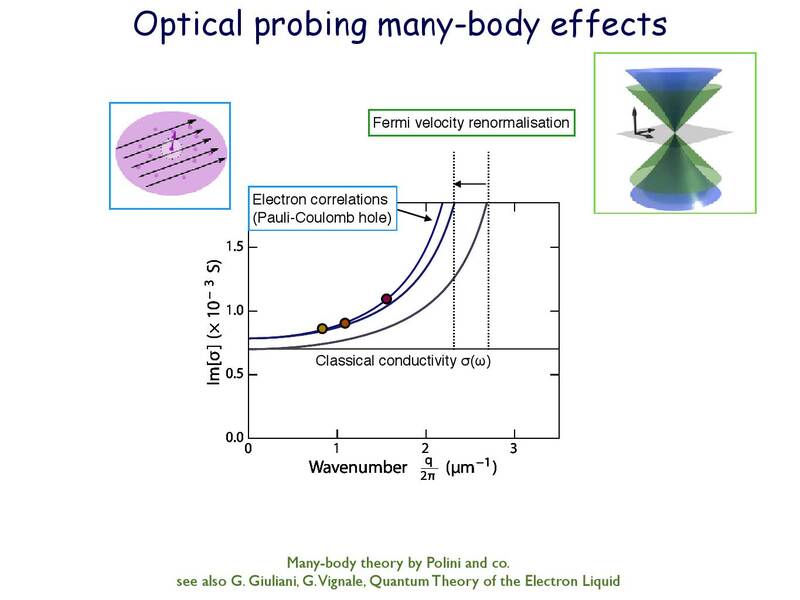 Keeping all that in mind, what we really need to do in the experiment, now, is to try to create an optical excitation that also has a length scale comparable to this non-local effect. 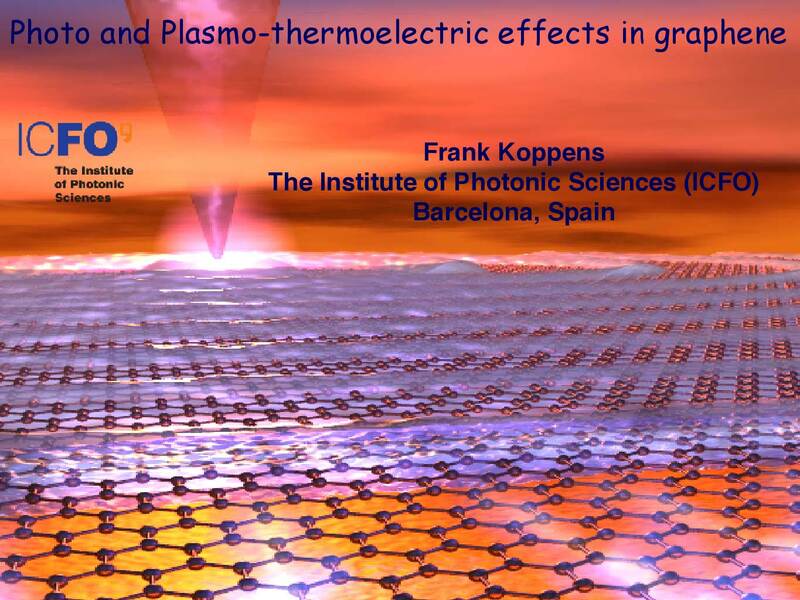 And that's what we can do, now, by exciting plasmons with a tip within the graphene. So we do this for terahertz frequencies — and now, you can see these interference fringes, again, as a function of carrier density. 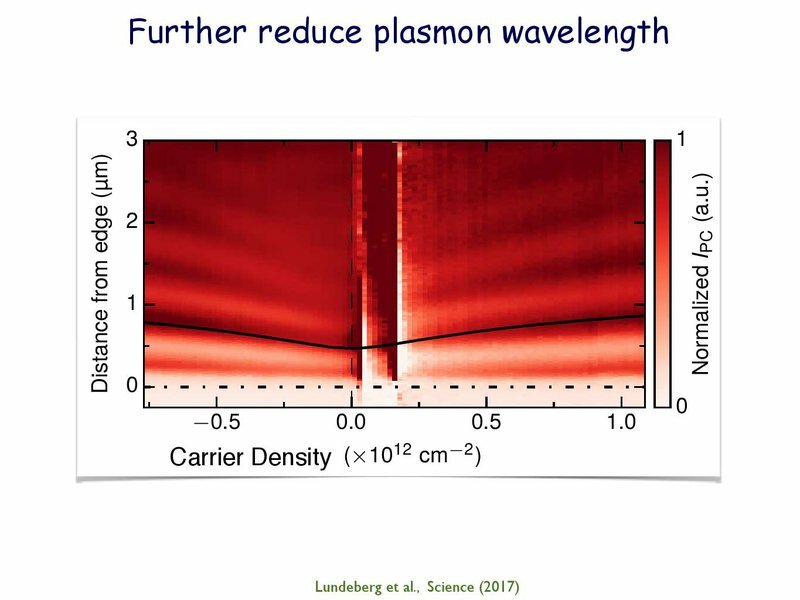 What you see is that you’re shrinking the plasmon wavelength for smaller and smaller carrier densities, until they're almost at this minimum closely-charged neutrality point. 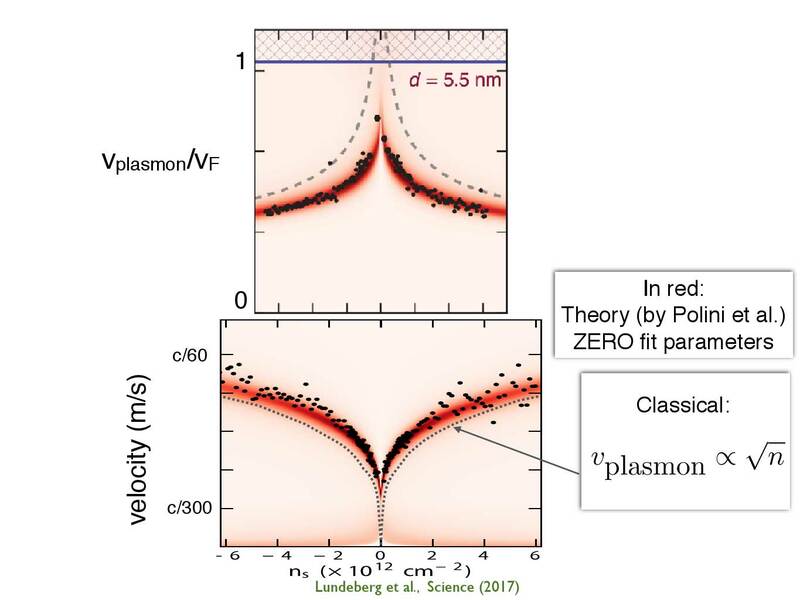 And that's where these non-local effects are strongest — where, basically, the plasmon wavelength becomes comparable to the non-local distance, or where the plasmon velocity becomes comparable to the velocity of the electrons. And that's what you see, now! 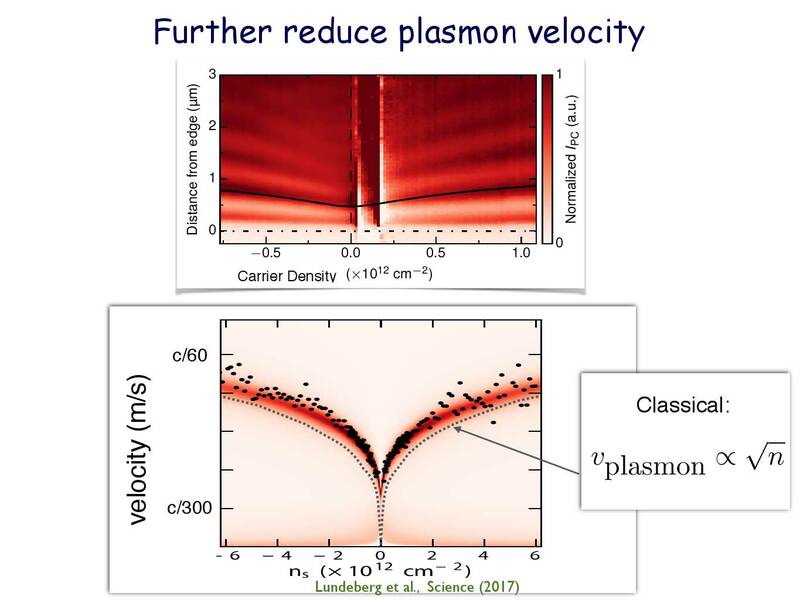 The panel above is the velocity of the plasmon as a function of carrier density. And it slows down and down and down, until it almost reaches the Fermi velocity! This is interesting, because, typically, collective excitations don’t move this slowly — they tend to move much faster. 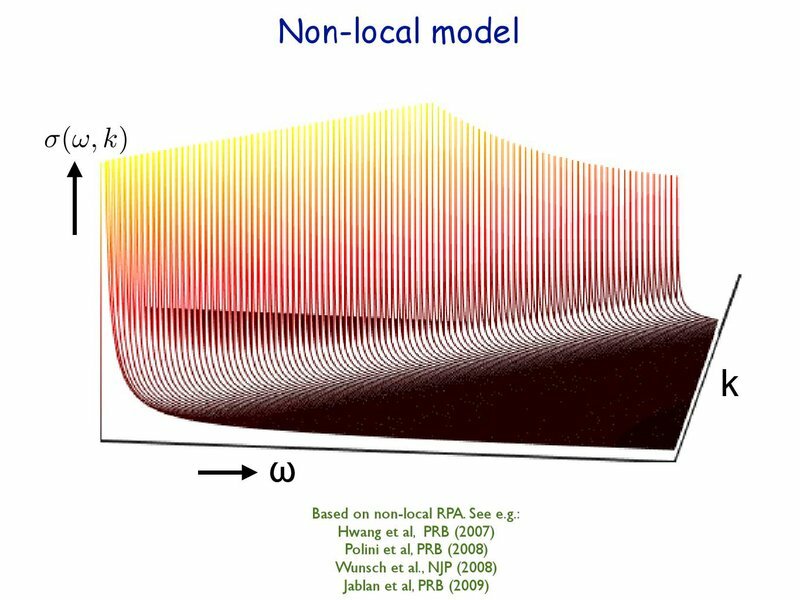 With this, you start to see very big deviations between, let's say, a classical mode and then a non-local collective mode. If you look at the slide above, you’ll find an easier way to visualize this. In this graph, I’ve plotted the velocity of the plasmon normalized by the Fermi velocity. The horizontal grey line is the classical model, and the black dots show the full non-local model, which includes several non-local corrections that I will explain in a second. But the deviation between the classical model and the local model is about a factor of two — which is very large. What you can extract from this, now, is the optical conductivity as a function of momentum. This is good, because, as we discussed in the beginning of the talk, that's basically what we'd like to do. So the blue line in the graph increases and approaches this resonance in momentum space and then, from all that, you can extract several parameters of non-local corrections. First, there's a Fermi velocity renormalization at low densities. That's related to many body effects because of screening (low screening, close to zero charge density). But also, other effects — such as electron correlations — are visible in this system, even though these measurements are done at room temperature. Some recent work I just want to briefly brush over, since I really believe it would have been of interest to Millie. Following in the same vein as Philip’s talk, I’d like to briefly discuss the effects on intercalated graphene. 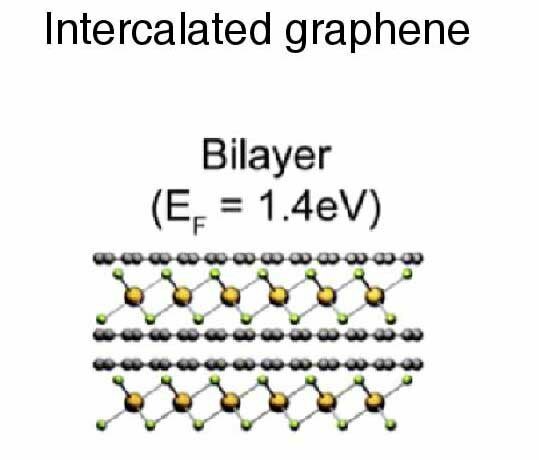 Above, you can see intercalated bilayer graphene. And if you look at the plasmons in that bilayer graphene, you'll also see something very interesting. First of all, you’ll see that the Fermi energy is huge. It's about 1.4 eV and carries plasmons. You can also see the interference fringes, near the edge. But at exactly the phonon energy, there is anticrossing in the plasmon dispersion and the plasmon effects are completely gone. However, what remains is some kind of periodic pattern of structure that we never understood. I don’t know. Maybe Philip has an answer to this. 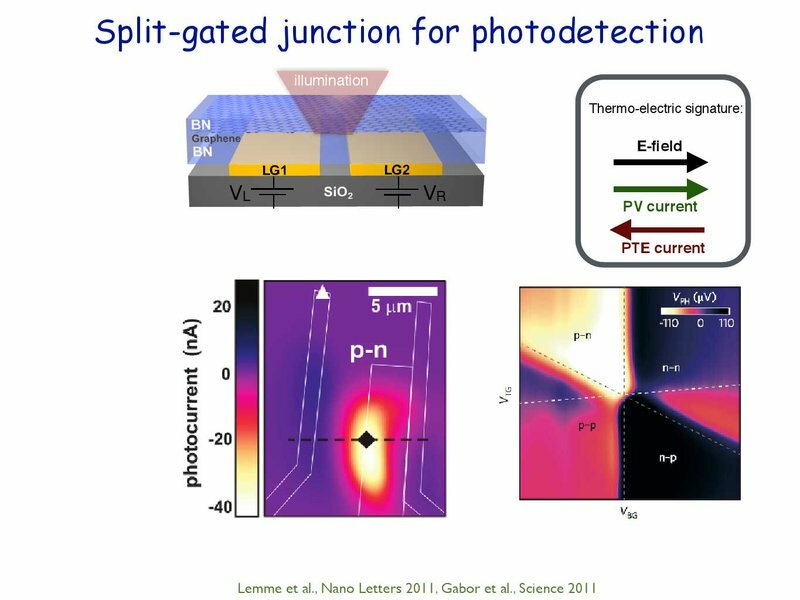 Another reason to work on plasmons is because of tunneling transistors. These are graphene, three layers of boron nitride, and then graphene, again. And, by applying a bias between the two layers, it creates an electron gas and a whole gas, and, effectively, this system becomes charge-neutral. 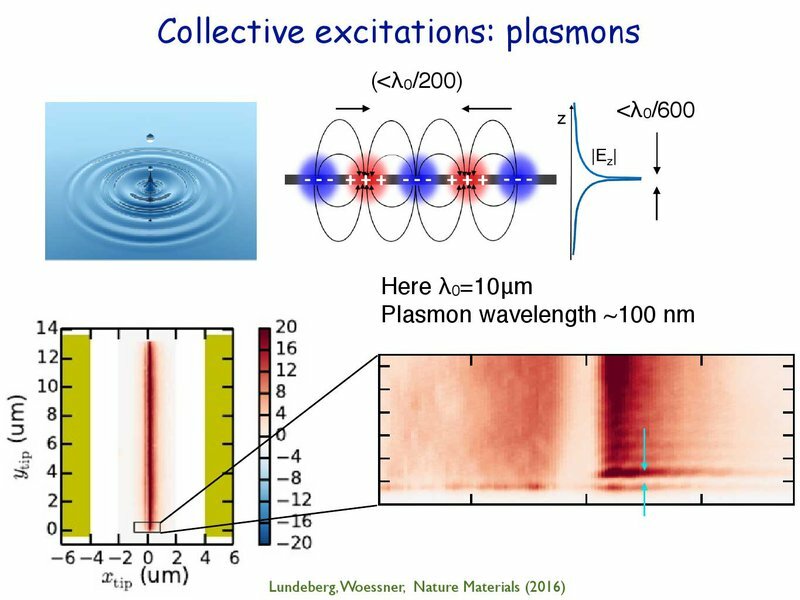 But, still, this system can carry plasmons, as you can see above, which is related to the collective excitations of the electron and whole gas (at the same time) by the incoming infrared light. 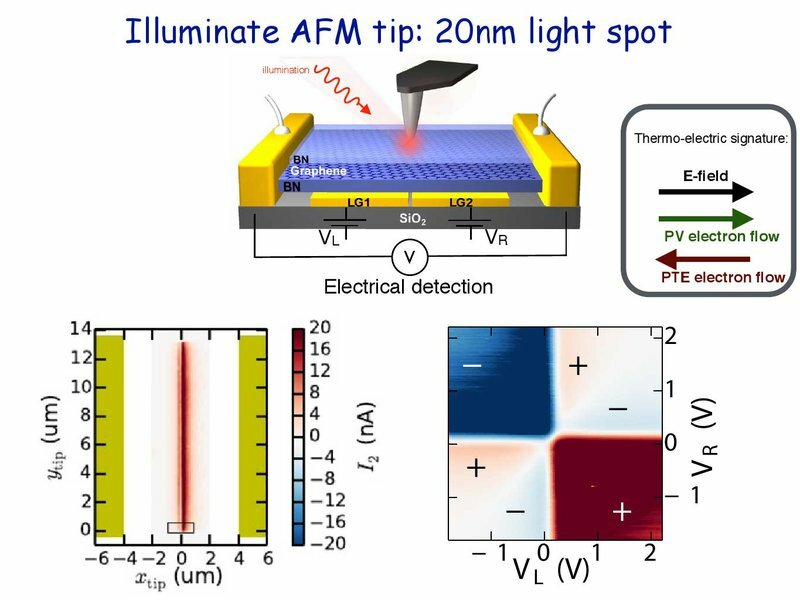 You can read more about that in the publication: Woessner et al., ACS Photonics 2017. 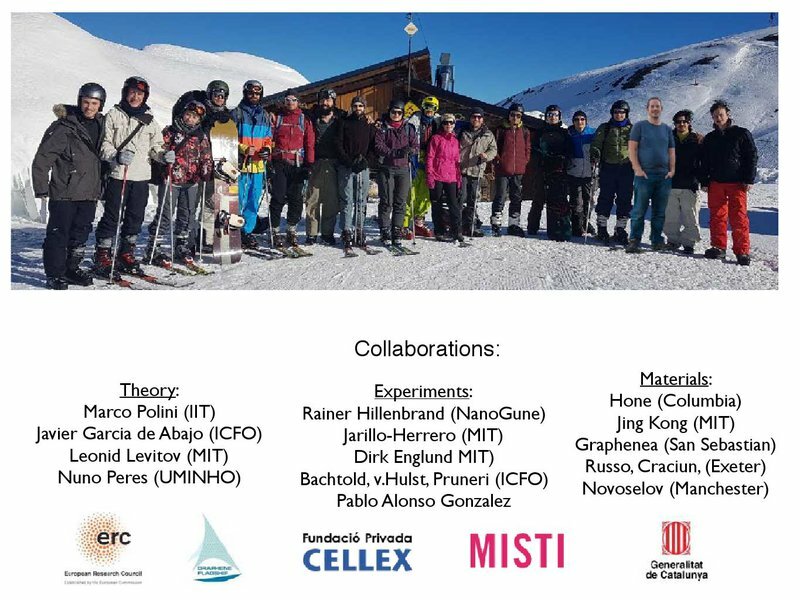 Because I'm from Europe, I should also say a few things about our graphene flagship program. We are very proud of that program — in fact, I see a few of its participants in the audience! The goal of this program is to study graphene and develop it to the point that we can have lots of different graphene applications. The program’s been up and running for 3 ½ years — and over that period of time, a lot of progress has already been made! 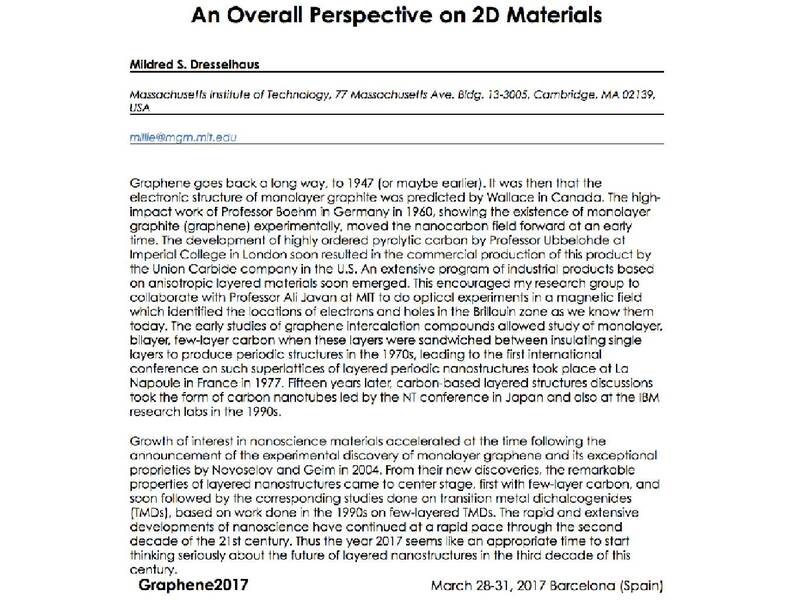 There are, of course, still many years ahead of us, but several important applications of graphene have already been realized. Graphene is no longer just something for the lab! 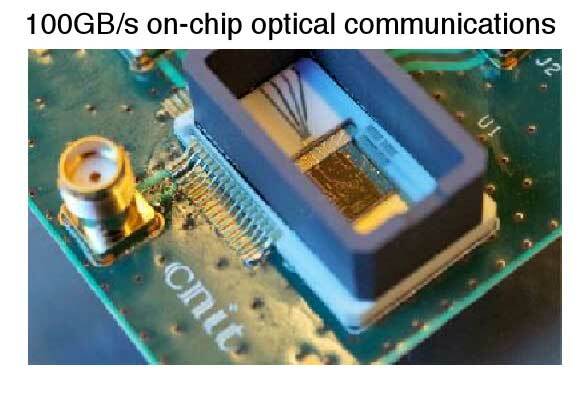 To the right, for example, you can see an on-chip optical communications system that operates at 100 gigabytes per second for transmitting data optically on the chip. 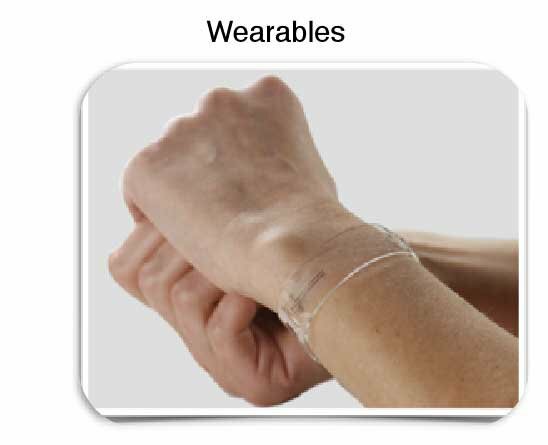 To the left, you can see a wearable device that is actually able to measure several health markers, such as heart rate and blood oxygen concentration. And above, you can see a recently created graphene camera. It’s the first camera where all of the photo detectors are made out of graphene — about 120,000 photodetectors. 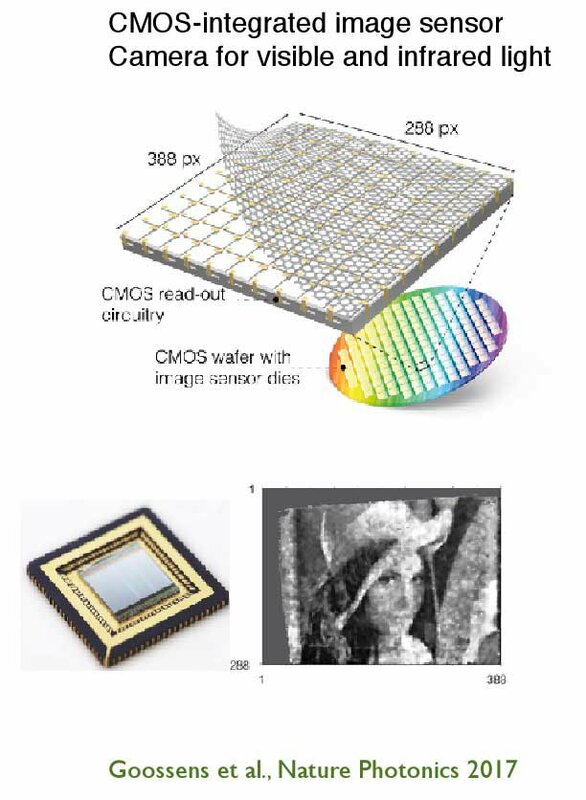 That means each of the pixels in the image above is one photodetector. And this system works for visible light and infrared light at the same time, which is very impressive! You can’t find any commercially available technology on the market, today, that can do that! So you can see that graphene really does have the potential to give us incredible technological advances. And, of course, I'd like to thank Millie for all the inspiration. Not just inspiration she’s given in the past, but that which her books and her legacy will continue to give us, for many years to come. And I intend to not just hog that inspiration all for myself, but to share it with the next, younger generation, as I get older. In the spirit of Millie, let’s all stay inspired and sit front and center at every conference!